I want to share with you some ADORABLE bracelets that Trashy Crafter sent to me! 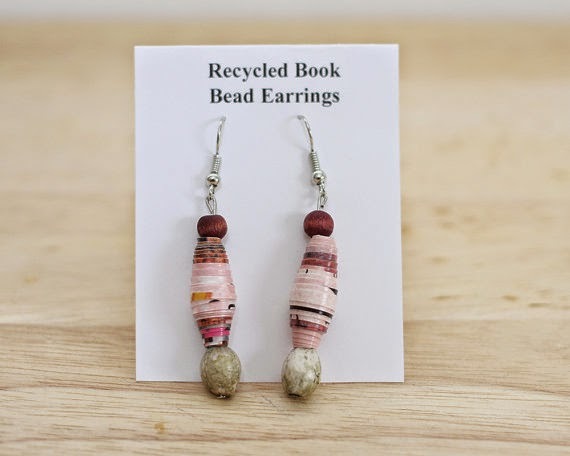 They are a mother daughter pair that is know for their recycled book jewelry. They gather damaged books from local libraries and thrift stores and roll the pages into beads. Each bracelet contains the recycled book pages and beads from broken necklaces from their local swap meet! I was so excited to get my bracelets in the mail, I was obsessed with packaging! Look how cute it is! My bracelets were made from a Dr. Seuss book! These would make wonderful gifts for your teaching team or parent helpers. It's never too early to start thinking about Christmas presents, right?? When we celebrate Dr. Seuss' birthday in March, I like to do a whole recycling unit, my bracelet will be a perfect example of how to recycle something old and turn it into something new and beautiful! If you would like to enter to win a pair of Trashy Crafter recycled earrings, please enter below! The winner is BECKY~ I sent you an email! I love these and just got on and ordered Christmas presents! Thanks for sharing!